I live in Tucson, Arizona -- a wonderful city in the desert in the southwestern USA, with mountains all around, an hour away from Mexico. This page has links that I use every day (for weather info, entertainment, etc) and other info that visitors might want. I update it as I think of pages I want to keep track of; please feel free to send me suggestions. When you click on a link, a new window (or tab) should open; when you close it, this window should still be here. Here are more Tucson photos. TucsonSentinel.com: This non-profit news source started in January, 2010, with staffers from the now-defunct (after 138 years...) Tucson Citizen. See Visitor Info for Downtown Tucsonan magazine, a monthly that covers what's happening downtown. There's updated road condition info online at www.az511.gov. Construction projects in Pima County are listed at www.roadprojects.pima.gov. Get current county road conditions by calling (520)547-7510. Airport shuttles: Tucson airport (Arizona Stagecoach), Tucson Airport (Sun-Tran Route 11), Phoenix airport (Arizona Shuttle). HAWKs, PELICANs, and TOUCANs: Tucson traffic engineers dreamed up these pedestrian and bicycle crossings that you'll see around town. Stravenues are roads on a diagonal, like the railroad tracks and Davis-Monthan AFB, both of which cut southern Tucson at an angle and make driving crazy. Watch out for roads that run along both sides of a wash (drainage ditch). Usually each side of the road is two-way traffic! There's more general info in the Local Links pages below. Tucson Friends of Traditional Music have dances and concerts. Invisible Theatre: Great performances from a long-established small theatre. Southern Arizona Symphony Orchestra: Great performances — in two venues, Tucson and Saddlebrooke — from a long-established (and excellent!) local orchestra. TucsonArt.info: a site I'm developing to list Tucson artists and public art. Along the right-hand side of each page are links to other art sites. Grand Cinemas: A local chain of budget cinemas that show popular movies a few months after they were first released. For three bucks (less for seniors and on Tuesdays), you can get out of the heat and see a film in a nice theatre. Ben's Bells: hundreds of Tucsonans make thousands of Bells and distribute them randomly around town to encourage kindness. Poco and Mom's has real New Mexican food (which is different than the Sonoran-style food at most "Mexican" restaurants here in Tucson). Waila, also called chicken scratch (says the Wikipedia article there), is from the Tohono O'odham people — who live (mostly) southwest of Tucson. It's fun dance music: usually accordion, guitar, bass, drums and sax. Meet Me at Maynard's is a weekly social walk/run event in downtown Tucson. There's also Meet Me at La Encantada in the Foothills. 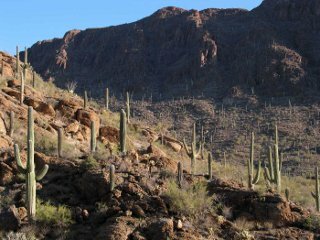 Pima County Parks Map: scroll down to see the list of trailheads. Tucson Parks and Recreation, including the Reid Park Zoo, free outdoor concerts from the Tucson Pops Orchestra, and a lot of other activities all through the year (listed in local newspapers). Here's a list and map of all city parks. Tohono Chul Park, desert gardens with wakling trails, a tea room and a gift shop. Sundials, a page I found listing sundials in the US. You'll find Tucson if you scroll down to the Arizona section. 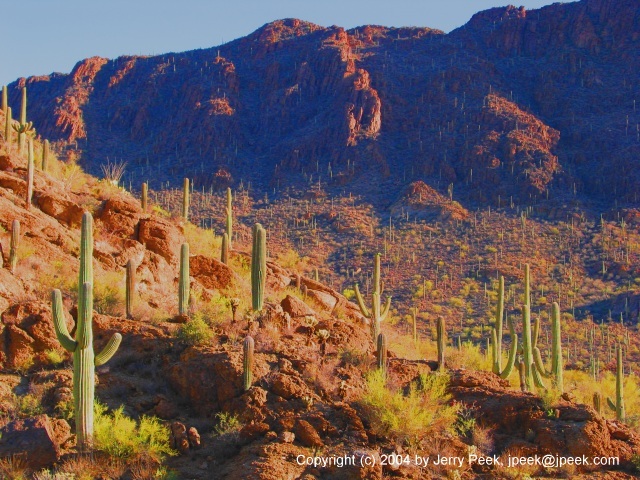 The Arizona Trail, a 790-mile trail between the northern and southern borders of Arizona, runs near Tucson. It's not finished (see the map), but it's coming along. The Tohono O'odham Nation Cultural Center and Museum is 10 miles south of Sells, Arizona (75 miles sourhwest of Tucson on Ajo Way, AZ highway 86). It's hard to find, in a remote area with almost no signs to guide you there... but it's worth the trip! A handsome new building that opened in 2007, it has exhibits on the Tohono O'odham people and art, a gift shop, temporary exhibitions and presentations, and more. There are photos on the Kelly, Wright & Associates web page. The Tucson Citizen article about its opening has a map (click on the map to enlarge). The Amerind Foundation has a museum of anthropology, archaeology and art east of Tucson. It's located near Dragoon, the spectacular Texas Canyon along I-10, with picnic tables among the big rocks. The Arizona Wine Growers Association website lists vineyards being developed as well as ones already there. Arizona has some great wineries, like Callaghan Vineyards and Dos Cabezas -- both in the Sonoita area. Linda Ronstadt’s Borderland is a New York Times travel article (December 29, 2013, by Lawrence Downes) with stories from the Tucsonan singer's life and places special to her. The Reader Comments (at tne end) are glowing. My tastes are all over the map. I tend toward vegetarian food, but I love a great Sonoran Hot Dog (from one of the many food carts, of course!) or a Smashburger. I’m not (usually) concerned if a place is run by some “religion” or other group that has a particular point of view… though, in each case, I'll mention it if I know about it. Here's a list that I'll build over time. Get there early for the best selection. Open Thanksgiving and Christmas, too. (At Thanksgiving, the Tucson location — at least — has a live turkey running around the grounds, posing for photos… and gladly accepting handouts of diners' vegetarian feasts :). Hours: Check their website (above) or call (520)792-0630. Wikipedia Tucson page: lots of information about Tucson from this volunteer-maintained online encyclopedia. Southern Arizona pages (the online 9th edition of Moon Handbooks' Arizona Handbook): lots of good info on Tucson and the area. Try the downtown walking tour. Tucson demographics by ZIP code from ZIPskinny (to find higher incomes, look north into the Catalina foothills). And here's a handy ZIP code map from Maps.Huge.Info. Need to find a doctor? The Arizona Medical Board website tells you whether a doctor has been investigated by the Board, had malpractice or other criminal convictions, lists where they studied and their specialties. Through Our Parents' Eyes, a history of southern Arizona (from the University of Arizona) full of images, sounds, and interesting bits of information. Rio Nuevo Archaeology: what's "down" downtown? The Center for Desert Archaeology has a great website with information about southern Arizona and northern Mexico. This page is about findings around downtown Tucson. Sadie & Dave Green, who live in England, have come to Tucson for long stays. Their blog, Arizona Spring 2008, has an interesting perspective on Tucson -- with good tips for both visitors and residents. Dr. Ann Linda Baldwin's biofeedback and stress-reduction knowledge has helped me so much with the challenges of running a small business (building websites, doing photography editing and promotion, etc.). I highly recommend her. Tucson on the Cheap keeps track of free events, low-cost offers, etc. Ghost Bikes - memorials to bicyclists struck by automobiles (in this town with one of the highest “bicycle-friendly” ratings in the USA, these seem even more sad). You think a red light is merely a suggestion. Most of the restaurants in town have the first name "El" or "Los." You think 60 tons of crushed rock makes a beautiful yard. You can say "Hohokam" and people don't think you're laughing funny. People break out coats when the temperature drops below 70 degrees. The best parking place is determined by shade instead of distance. The AC is on your list of best friends. You realize that Valley Fever isn't a disco dance. You can correctly pronounce the words: Saguaro, Ocotillo, Tempe, Gila Bend, San Xavier, Canyon de Chelly, Mogollon Rim, Cholla, and Ajo. You experience third degree burns if you touch any metal part of your car. You know better than to get into a car with leather seats if you're wearing shorts. Thanks to long-time Tucson resident Lannie Hartman for many helpful suggestions. CatScratch Graphics (which is offline now) made the cactus icons on this page. The CSG icon was reduced by GifOptimizer (also not online anymore).